A Tad Aggressive - . On the right side of this garden bed were two gigantic tomato plants. Unfortunately, they were taken over by some weird little bugs and we could not save them. We cleared out that half of the bed earlier today. 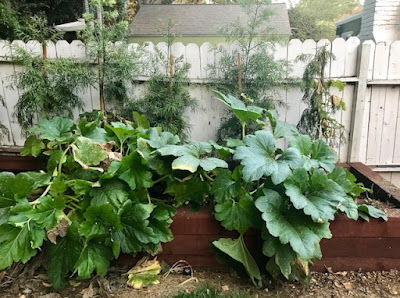 I went in the backyard a few hours later and found that the zucchini had already moved in and taken over. I believe the weird little bugs may have been on the zucchini's payroll. Hope you haven't been working as hard as the squash and have enjoyed your Labor Day. A couple of years ago it was all out war between the zucchini and the tomatoes in my garden. The tomato plants won that battle, but then started in on each other.